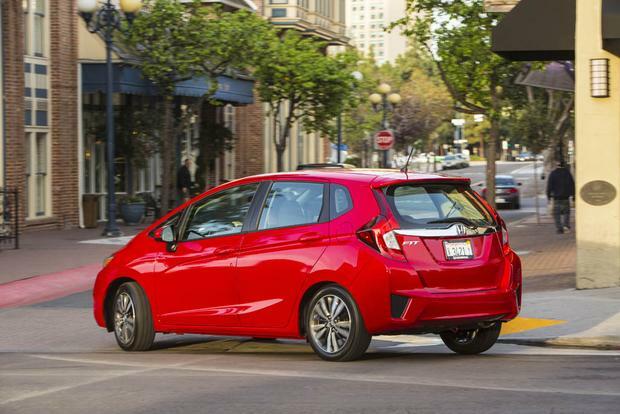 If you're consider a car that costs less than $20,000, the 2019 Honda Fit and its unmatched versatility need to be on your must-drive list. 2018 Honda Civic vs. 2018 Honda Fit: What's the Difference? There are some surprising differences between the compact Civic and subcompact Fit. There are great new car options in the $20,000 range. 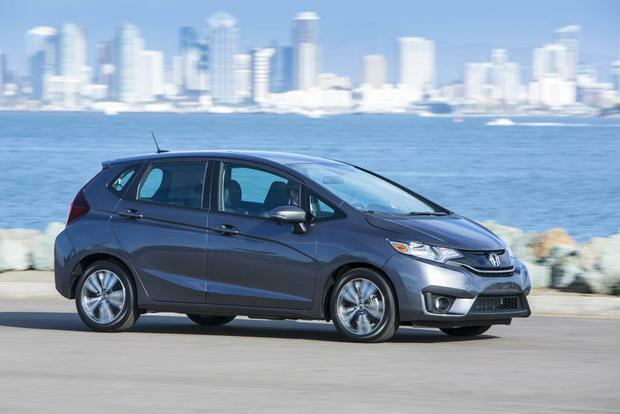 The 2017 Honda Fit lives up to its name, as no other car gets the most for the least in terms of providing abundant interior space within a tiny subcompact package. In fact, its 52.7 cu ft. of maximum cargo space is better than quite a few SUVs. If you're looking to downsize into a more efficient and less expensive car or simply want to get the most car for your money, this Honda should be a terrific fit. See what we did there? Horrible puns aside, the 2017 Fit is more than just a huge cargo compartment on wheels. There's also more interior space than its rivals offer (at least in the rear -- taller drivers may still be a bit cramped) and a little engine that delivers above-average acceleration for a subcompact car and exceptional fuel efficiency, as well. 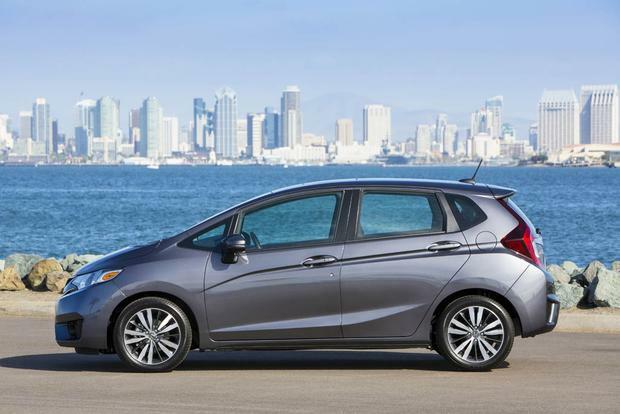 This latest Honda Fit, which was completely redesigned 2 years ago, also ups the ante in terms of interior quality, driving refinement and standard feature content. The base model is not the stripper it once was, and the range-topping model offers niceties like heated leather seats and a navigation system. 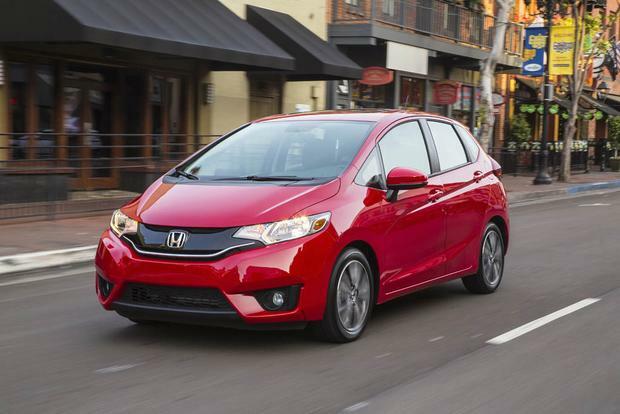 Ultimately, the Fit is your best choice among subcompact cars. It is a bit pricier to start, but if you're interested in more equipment, that difference evens out. And really, we think any premium is well worth what you get from this excellent little hatchback. 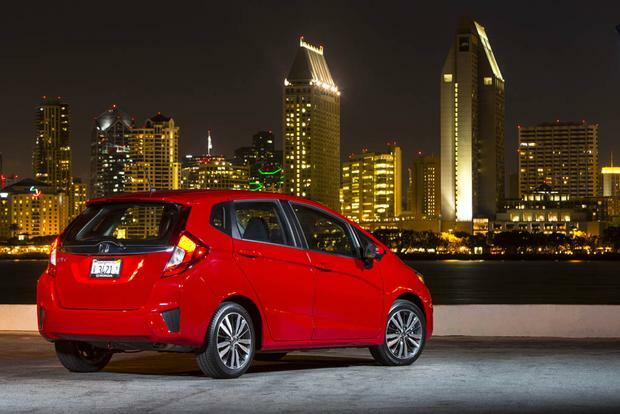 The Fit offers just one engine: a 1.5-liter 4-cylinder that makes 130 horsepower. When mated to the hatchback's standard 6-speed manual transmission, it returns 29 miles per gallon in the city and 36 mpg on the highway. Opt for the fuel-saving continuously variable automatic transmission, and you'll get 32 mpg city/37 mpg hwy in the EX and EX-L trims or an even more impressive 33 mpg city/40 mpg hwy in the base LX. The base-level Fit LX ($16,100) comes with all the basics, including 15-inch steel wheels, automatic headlights, power accessories, air conditioning, a backup camera, a height-adjustable driver seat, Bluetooth phone and audio, a USB port and a 4-speaker sound system. Step up to the Fit EX ($18,000), and you get 16-in alloy wheels, foglights, a sunroof, keyless start, Honda's LaneWatch blind spot camera, a 7-in touchscreen interface, an additional USB port, an HDMI port (for use with certain HondaLink smartphone connection features) and a 6-speaker sound system. Topping the range is the Fit EX-L ($20,400), which boasts leather upholstery, heated front seats, heated mirrors and a leather-wrapped steering wheel and shift knob. Optional on the EX-L is a navigation system integrated into the touchscreen along with satellite radio and HD Radio. All Fit models come standard with a wide range of safety features, including front-side airbags, side-curtain airbags, 4-wheel anti-lock brakes, stability control, traction control and a backup camera. In addition to these features, drivers who choose a Fit EX get the LaneWatch blind spot camera as standard equipment, along with an improved backup camera that touts sight lines for reversing. 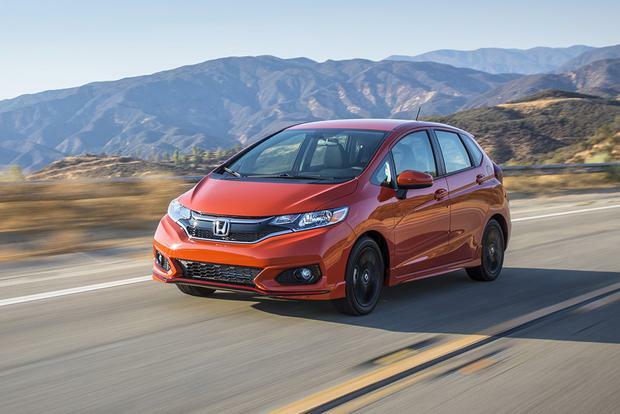 In National Highway Traffic Safety Administration crash-testing, the Fit earned perfect 5-star ratings for overall, frontal and side crash protection. In testing conducted by the nonprofit Insurance Institute for Highway Safety, the Fit received top Good marks in all crash tests but the new small-overlap front crash test, in which it received a second-best Acceptable rating. 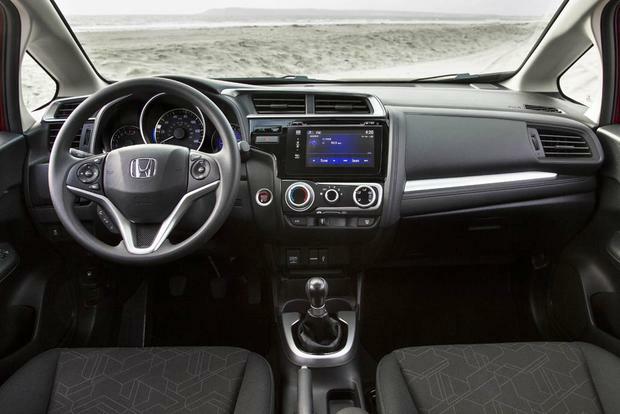 The Fit may not be as comfy or as upscale as its bigger Honda siblings, but interior materials are still a cut above the rest. The cabin even looks pretty cool, especially with the available touchscreen interface, although that particular feature frustrates with its menu structure, small virtual icons, lack of supporting physical buttons and no volume knob. Now, when you get behind the wheel of the 2017 Fit, you'll find that it's especially enjoyable to drive. A longer wheelbase and revised suspension tuning make it one of the most nimble subcompact cars around, yet it's also more comfortable and less susceptible to choppy pavement. The otherwise small engine also punches well above its weight class -- with the continuously variable automatic transmission, it delivers better acceleration than its rivals. So it's great to drive, but really, the Fit's main appeal is its interior versatility. Its so-called "magic" rear seat provides truly impressive, adult-friendly space and flips up to create a flat floor space for dogs or other bulky items. The whole seat also folds completely into the floor, creating a low and commodious cargo area that rivals some small SUVs. Folks looking to downsize into a smaller car should really appreciate all the space it provides. 2017 Chevrolet Sonic -- The Chevrolet Sonic touts excellent gas mileage, modern styling and a long list of equipment. It also offers a sedan body style for shoppers who would prefer a locking trunk to a rear cargo area. 2017 Ford Fiesta -- The subcompact Ford Fiesta offers a modern interior, excellent gas mileage and competitive pricing. It's also available in a sedan body style or as a sporty 5-door version called the Fiesta ST.
2017 Kia Soul -- The Soul can't come close to the Fit's fuel economy, but it does boast a similar price tag and value, an even bigger cargo hold, an SUV-like elevated seating position, a stronger engine and cooler styling. Used Honda Civic -- If you like the Fit's price but want a sedan or generally more refinement, opting for a used Civic could make sense. Though not offered in a 4-door hatchback until 2017, the Civic touts great comfort, more power and a few extra features.